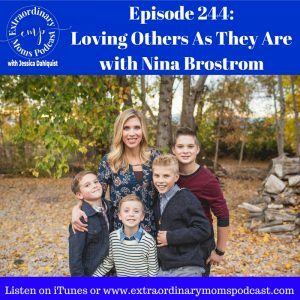 Today my guest is the amazing Nina Brostrom. Nina is a mom of four boys, some of whom have ADHD. In this conversation, we talk about the struggles of some of her kids, her own battle with control, and in the second half we talk about how her brother coming out as gay completely changed the way she viewed those who were different than her. Not only that, but after opening her eyes to the LGBTQ community around her, she saw a need for additional resources and support and she did something about it. This is not an episode about taking sides on what can be a sensitive topic. It’s really about loving others as they are and removing the shame that many feel because they are different. No parent wants their child to feel they are loved and accepted conditionally. And just like she loved her brother for who he truly was, she began to see her boys and their challenges/differences in a new light and with a renewed love.